James Pam is having a great season in front of goal. The Peterborough Northern Star Blue Under 15s player took his tally for the season to 16 from six games when firing a treble in his side’s 7-0 win over Gunthorpe Harriers on Sunday. With Holbeach being held to a draw by Spalding, Star have now gone top of Division One. 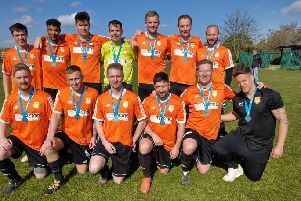 Third-placed Deeping Rangers, treble winners in the Junior Alliance League for the last two seasons, are snapping at their heels. John Carver’s side smashed Stanground Sports 11-0 on Sunday with Alfie Ferguson hitting four of the goals and Nathan Pickering and Alexander Moroz both bagging a brace. Two players setting Under 18 Division One alight are Bourne Town Black’s Ian Goode and Zac Munton. They’ve netted 30 times between them (Goode 16 and Munton 14) in six games and it’s steered Bourne to the top of the table. On Sunday, they beat Riverside 8-0 with Goode grabbing four of the goals and Munton three. Under 16 Division One leaders Stamford Red beat March Town 1-0 thanks to a goal by Kieran Bonsall.